Volodymyr Balukh. Photo: Aleksandra Efimenko. All rights reserved.Volodymyr Balukh is your average Ukrainian farmer. There was a Ukrainian flag flying from his roof. One of his t-shirts had a picture of a Cossack on it. But Volodymyr’s house and his t-shirt are in Crimea, in the village of Serebryanka in the peninsula’s Rozdolne district. Balukh was opposed to Russia’s annexation of the peninsula, and this was common knowledge in the village. The flag on his roof led to three criminal charges against him. The string of criminal cases against Balukh began in spring 2015, when the security services conducted the first search of his home. FSB officers turned up at the home of Balukh and his civil partner Natalya on the pretext of some spare car parts having disappeared in the village. Six months later, they turned up again, and this time they not only searched the property but dragged him out onto the street, pushed him into a car and beat him up. They faced no sanction for this – on the contrary, it was Balukh who received 10 days detention for “failure to obey a police order”. The Russian siloviki just needed time for the bruises left on the farmer’s body to disappear. While Balukh was under arrest, the Rozdolne district department of Russia’s Investigative Committee launched the first case against him. He was accused of “insulting a representative of authority”. The case was “sewn” with great speed: the investigators conducted their investigation in two days before passing it on to the prosecutor’s office. In February 2016, Volodymyr Balukh was sentenced to 320 hours of community service. Balukh refused to comply with the sentence and it was changed to 40 days in a penal settlement. Some people would have left it at that and stopped making their beliefs known, but not Balukh. In November 2017, he hung a sign reading “Heroes of the Heavenly Hundred Street” on his house, to commemorate the people who died during Euromaidan. The village head called on him the same day and asked him to remove it, but Balukh declined. A month later, the FSB returned to search his house once more: this step was initiated by the FSB’s Crimea chief Viktor Palagin himself – he had requested the courts to carry out an “investigation of the premises”, in other words a de facto search. The search took four hours, culminating in Balukh’s arrest: officers “discovered” 90 cartridges from Barnaul ammunition factory on his roof, right under the flag he had hung there. The search of Vladimir’s house was carried out by former members of the Ukrainian Security Service (SBU). One of them was Alexey Leonov, who until spring 2014 was a major in the SBU and worked in its Crimean headquarters, but was afterwards charged with desertion when he crossed to the Russian side. Apart from the ex-SBU officers, the search team also included Alexander Lopatin, a former member of the Berkut special unit. He now heads the Rozdolne district police operations department. Volodymyr Balukh’s second trial was complicated by the lack of proof of his fingerprints on the infamous cartridges. This was no surprise, as he couldn’t have left his prints on them – they were, after all, planted by the FSB. Balukh’s defence lawyer Olga Dinze also requested an investigation of where, and to whom the cartridges were being sent, but the judge refused this request. In October 2017, Volodymyr Balukh was convicted of illegal possession of ammunition and sentenced to three years and seven months in a penal settlement and a 10,000 rouble fine, reduced by two months on appeal. But several months before the sentence could be carried out, Balukh was charged with a third offence. The charge, brought by investigator Bondarenko, concerned “the commission of an offence under Part 1 of Article 318 of the Russian Criminal Code”, relating to “the use of violence against a representative of authority”. It was instigated after Valery Tkachenko, the head of the pre-trial detention centre where Volodymyr was being held, filed a complaint about him. On 6 December 2017, the article under which Balukh was charged was changed to Part 2 of Article 321: “disruption of the work of an isolation facility”. According to Tkachenko, Balukh attacked him during a routine inspection of his cell, punching him in his stomach and then hitting him on the arm with a bottle of detergent. Balukh’s defence lawyer immediately countered that the case was a complete fabrication and that it was Tkachenko who attacked Balukh, swearing at him and insulting him for being a Ukrainian. It later transpired that the FSB had forced the detention centre’s head to write the report on Balukh, and the CCTV footage of the incident showed clearly that it was Tkachenko who started the fight. 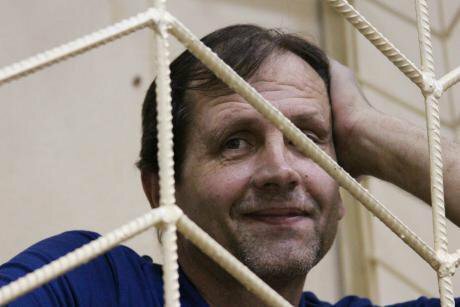 On 19 March this year, Volodymyr Balukh began a hunger strike in protest at the fabricated charges against him. Today, he is practically unrecognisable in the courtroom, emaciated and exhausted. The Ukrainian government has asked for permission for Ukrainian doctors to visit him, but this hasn’t happened. Russia’s ombudsperson Tatyana Moskalkova has visited Balukh and said that she asked how he was feeling – but that was all. On 5 June, Balukh was sentenced to five years in prison and a 10,000 rouble fine – the sentence was cumulative, taking into account his previous two convictions. His defence team plan to appeal against the sentence. Ukrainian human rights organisations have criticised the accusations against Balukh as politically motivated: they consider him a political prisoner who is being persecuted for his political stance and his support of Ukraine’s territorial integrity. The prosecution of Volodymyr Balukh has been a show trial for those who are not prepared to accept the new reality of Russian-occupied Crimea. Grassroots political activity is impossible on the peninsula, as is any other opposition to the Russian authorities, which occupied Crimea in 2014. Balukh’s family, as well as the many people who are following his case, are hoping for a prisoner exchange. This is of critical importance given the state of Balukh’s health – he has lost a lot of weight over the nearly four months of his hunger strike. Volodymyr’s decision to go on hunger strike is a cry to alert people to himself and his position, which three court cases haven’t broken.